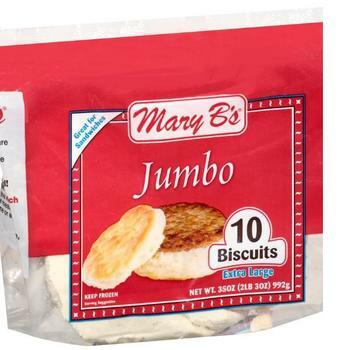 Hom/Ade Foods is recalling Mary B’s brand biscuits that may be contaminated with Listeria monocytogenes. There has been no illness to date associated with these products. The code may be found on the back of the bag, lower right corner. The recalled products were sold in retail stores in Alabama, Arkansas, California, Florida, Georgia, Illinois, Indiana, Kansas, Kentucky, Louisiana, Maryland, Missouri, Mississippi, North Carolina, Oklahoma, Oregon, Pennsylvania, South Carolina, Tennessee, Texas, Virginia, Wisconsin and West Virginia. Consumers with questions may call Hom/Ade Foods at 1-855-562-7773, Monday – Friday, from 8 a.m. – 5 p.m. (CT).